To better determine energy leaks at Sandia's powerful Z machine—where remarkable gains in fusion outputs have occurred over the last two and a half decades, including a tripling of output in 2018—a joint team from Sandia and Lawrence Livermore national laboratories have installed an upgraded laser diagnostic system. The quest to accurately understand how much power makes it into Z's fusion reaction has become more pressing as Z moves into producing the huge number of neutrons that now are only a factor of 40 below the milestone where energy output equals energy input, a desirable state known as scientific break-even. The Z machine's exceptionally large currents—about 26 megamperes—directly compress fusion fuel to the extreme conditions needed for fusion reactions to occur. Laboratory fusion reactions—the joining of the nuclei of atoms—have both civilian and military purposes. Data used in supercomputer simulations offer information about nuclear weapons without underground tests, an environmental, financial and political plus. The more powerful the reaction, the better the data. Both innovations bounce a laser beam off a moving target at the center of Z. But there's a big difference between the two techniques. VISAR uses a fiber cable to send a laser pulse from a stable outside location to the center of the machine. There, the pulse is reflected from a point on a piece of metal about the size of a dime called a flyer plate. The flyer plate, acting like a mirror, bounces the laser signal back along the cable. But because the flyer plate is propelled forward by Z's huge electromagnetic pulse by a distance of roughly a millimeter in a few hundred nanoseconds, the returning pulse is slightly out of phase with the input version. Lawrence Livermore's improvement to the device, now installed at Z, was to send a laser beam along an optical beam path instead of a fiber cable. Passing through lenses and bouncing off mirrors, Line VISAR returns a visual picture of the pulse hitting the entire flyer plate, rather than returning a single electrical signal from a single point on the flyer plate. 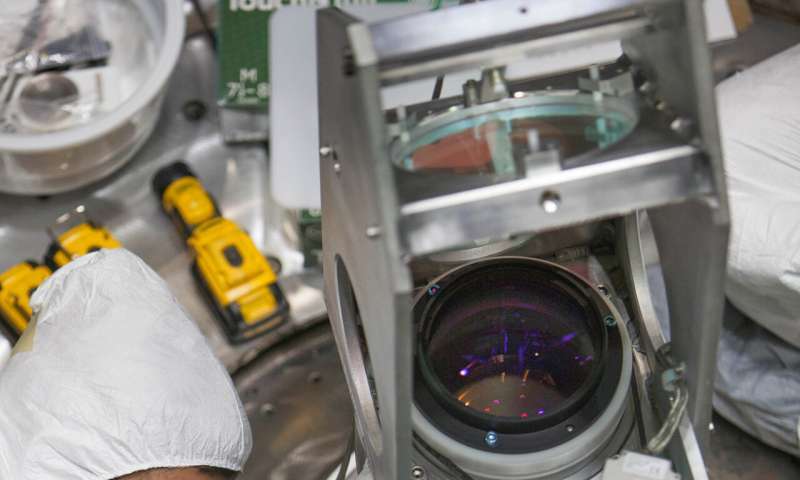 "Because you have spatial resolution, it tells you more precisely where current loss occurs," said Clayton Myers, who's in charge of experiments at Z using Line VISAR. "The Sandia team was tasked with integrating the various Line VISAR components into the existing infrastructure of the Z machine," Myers said. "This meant, among other things, engineering a 50-meter beam transport system that provided a buffer between the instrument and its Z target." How does the new detection system work? "Wonderfully," said Myers. "I can hardly believe the precision of the data we're getting."